Team Work: Nurses, health agents and translators. 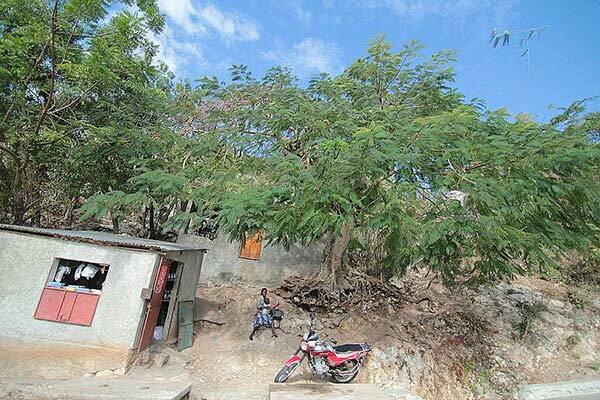 Did you know Haiti is ranked Number 1 in the Western Hemisphere, and Number 21 in the world…for infant deaths in children under the age of five? 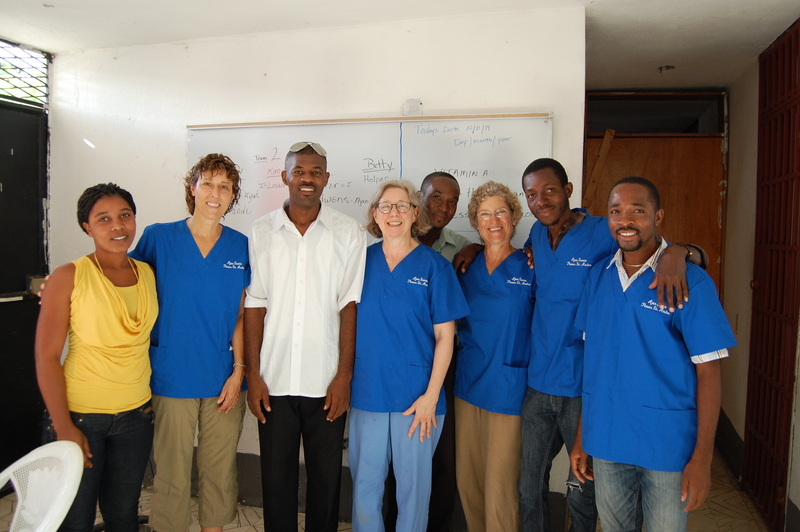 With these dismal statistics in mind, I headed to Haiti in November 2014, joining a contingent of nurses led by Betty Kasson, RN, also of St. Dunstan’s. 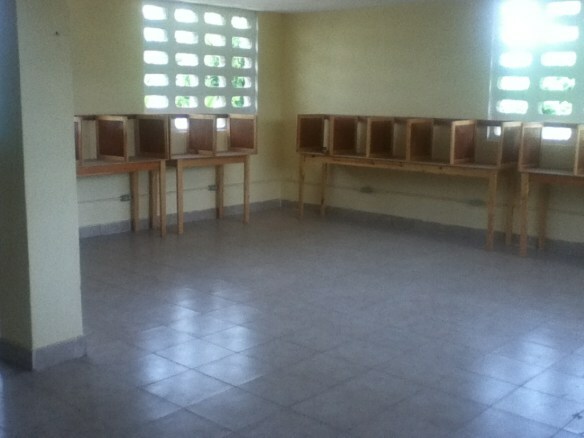 We were determined to see how we could help our sister parish of St. Andre’s in Haiti make a difference. 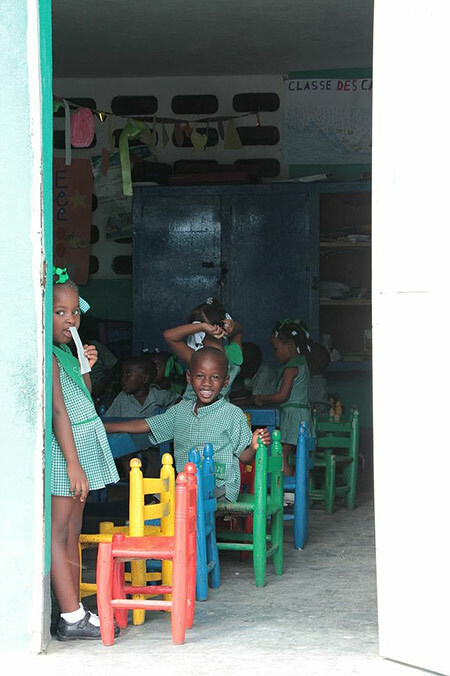 Our goal was to establish health records for the 950+ students of St. Andre’s, provide nursing care, and hopefully train “Health Agents” from the St. Andre’s parish to carry on the health work. We filled extra suitcases with medical supplies and donations from Direct Relief, Community Hospital of the Monterey Peninsula and Henry Schein Medical, and some 1,000 toothbrushes and dental floss from the Sutter family for a dental education program. A new partnership with Vitamin Angels provided Vitamin A and Albendazole as a deworming medication, as well as prenatal vitamins for women. 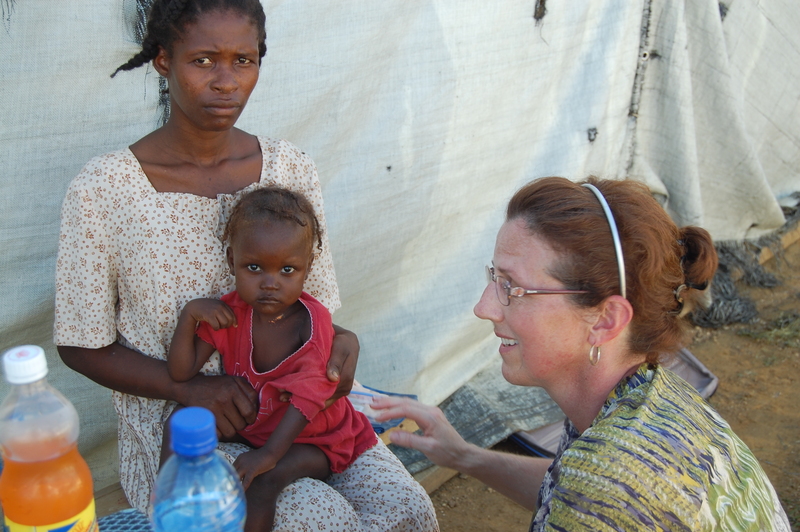 We anticipate the vitamin, deworming programs, along with the food program, will greatly increase the children’s survival in this community. The trip was an amazing experience for all of us. The team, along with our partner St. Andre’s volunteers, assessed eight different classes at St. Andre’s school, from pre-school through 6th grade. Two teams then gave classes on hand and dental hygiene. The kids loved it, and we gave a toothbrush and floss to all 950+ students that day. 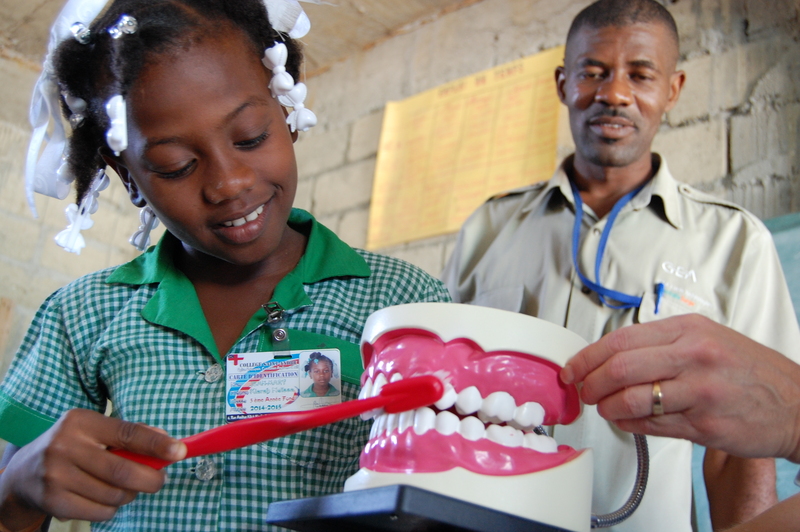 It was rewarding to see how much the students of St. Andre’s already knew about hand and dental care, being taught how to avoid many of the illnesses that poverty invariably brings. 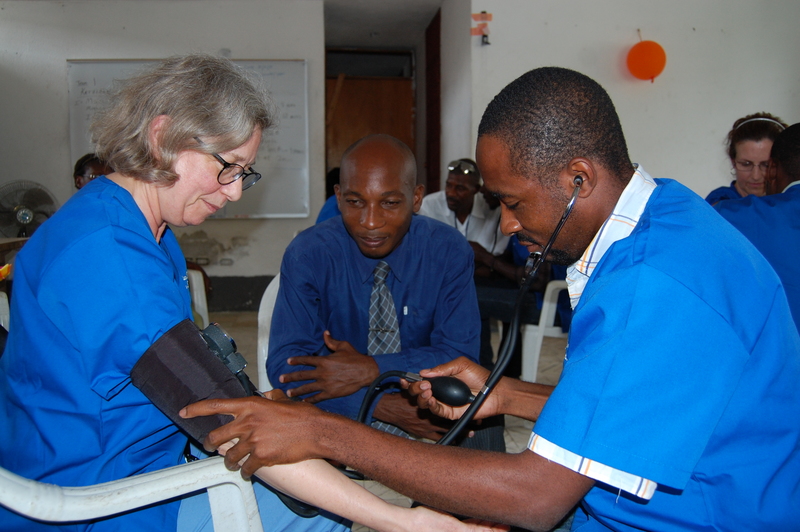 Perhaps best of all, we were blessed to have three impassioned Haitian volunteers agreed to continue as Health Agents for the school and community. We gave them training to learn basic wound care, fever treatment and vital signs measurement, as well as Vitamin A and Albendazole distribution as part of the Vitamin Angels’ grant. The team also traveled to one of Father Noe’s rural church/schools in Labegue, where we saw and felt the greatest effects of poverty on health. At St. Andre’s, we had seen evidence of a high parasitic burden in the children. However, in Labegue we saw parasitic loads worsened by malnutrition. Rural schools do not have a daily food program like St. Andre’s. We saw and treated a wide variety of maladies including skin parasites, ear infections and anemia, all worsened by malnutrition. The meal program provided to the students at St. Andre’s truly is a blessing to that community! 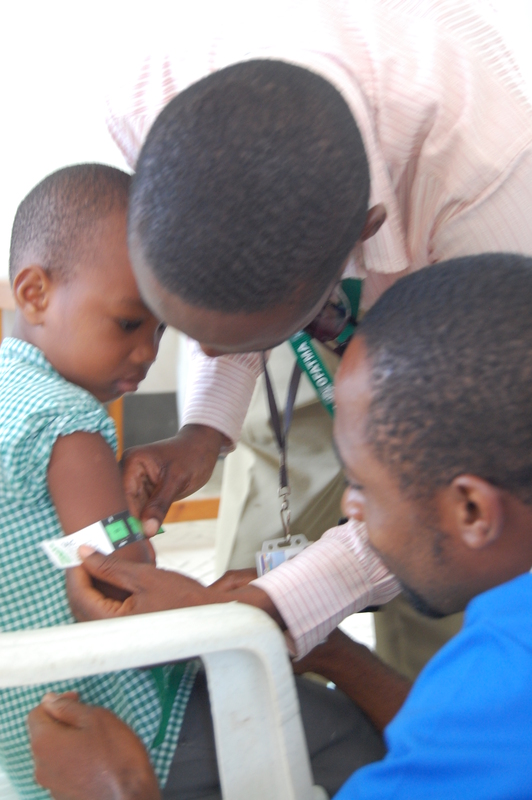 Health Agents measuring for malnutrition! Your help is needed NOW! Help us with ideas for a fabulous fundraising event OR grant OR funding resources. 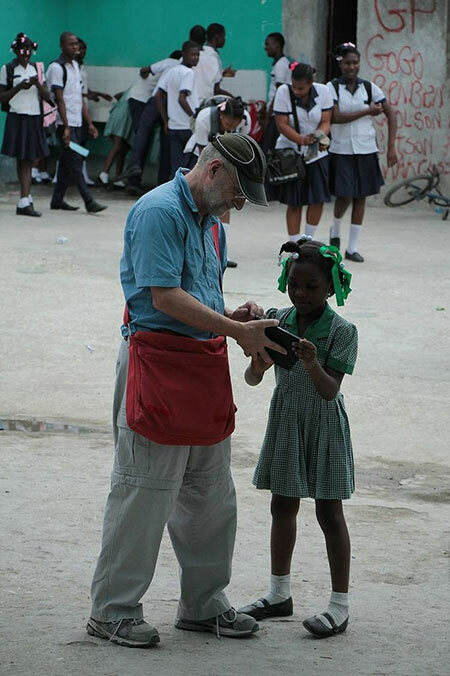 Last week I traveled to Hinche with my brother, Gregory, who was my travel companion and videographer. Our motto for the week, “pwoblém pap fini” (problems are never finished) came courtesy of our friend Etiénne. Meet with Pere Noé about how our teacher training teams have been doing and how we can improve the training program. Meet the local teachers who have been involved in the two training programs that have taken place, one in January and one in June. Meet the new English teacher Linda, observe her classes, and see how the materials that our teams brought down in June were being used. 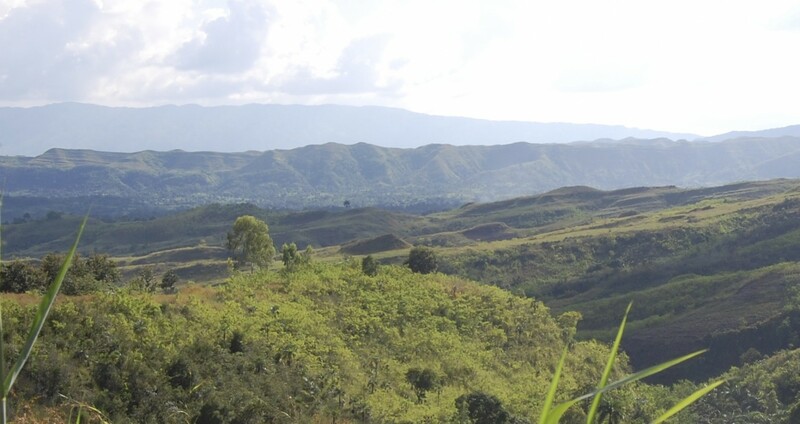 Take lots of video footage and photos, conduct interviews with Pere Noé, teachers, and students for a promotional video on our MIIS immersion programs. Pere Noé was very busy as usual, especially with new students arriving and parent meetings with the new semester recently in gear. But we had a chance to talk about how the MIIS teams were doing, and he feels that the English instruction has definitely benefitted from the teacher training. It was overwhelmingly wonderful to meet with Shester Severe, Marc Arthur Esperance, Evens Israel, Supreme, Neilson, Willforte, and others who had been involved in the training programs. They were so grateful, positive and supportive in helping me with information that will help develop the program further. All the teachers but Evens provide English lessons for free in the community every Saturday. 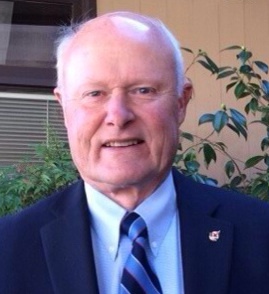 In addition to teaching English, Neilson is a secondary school supervisor for 20 schools in the region. 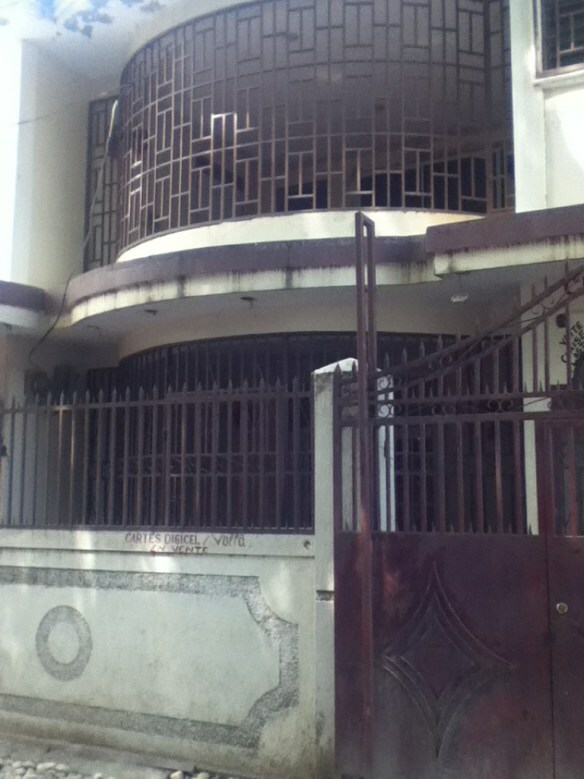 They especially appreciated learning the concept of developing learning objectives (SWBAT–the student will be able to…) aligned with lesson plans and differentiating teaching methodologies for the different levels of English proficiency among their students as well as their different purposes for learning English. 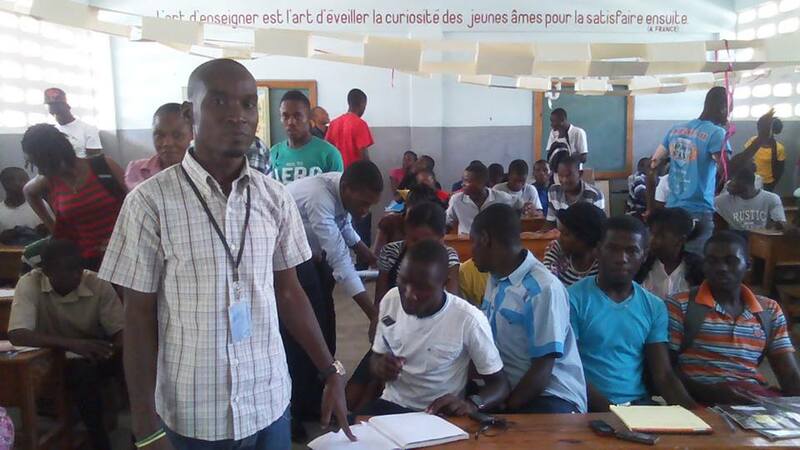 Purposes for learning English in the community range from being interpreters, traveling to the US, interacting with English speakers and NGOs in Haiti, and having a definitive advantage over non-English speakers in the job market in Haiti. As the English exam at the school emphasizes reading comprehension, an essay, and grammar, more needs to be done to develop students’ speaking abilities. This comes from less emphasis on teacher-centered teaching and more on student-centered creative activity. This kind of transition from a centuries-long teacher-centered approach takes time, but we have very intelligent, motivated, and receptive and eager teachers! Unfortunately, I was unable to meet Linda, as she is about ready to deliver a baby. So English lessons in the lower grades does not appear to be happening at this point–probably she will resume after the first of the year. So I was unable to see the materials we sent there in June. More work to be done on this front. Thanks to Pere Noé for arranging a meeting with the Minister of Education for the Central Plateau! The meeting was very productive, in that I was able to get a copy of the exit exam for the 13th grade for English and Spanish, which will help our curriculum developers align the English curriculum with the ministry’s standards. He also promised to send me the benchmarks for each grade (I will follow up by email). In addition, I got the names of the books the ministry sanctions for English teaching. Best of all, the Minister was enthusiastic about a joint teacher training certificate, and I learned that the standard for earning a teaching license is, after two years of teaching, to submit a full curriculum with lesson plans to the ministry. That is perfectly in line with the kind of training we are already providing, but gives the program more focus on licensure for teachers. Supremely exciting!! The Minister even wants his wife to join our program. Thanks to Shester and Marc for accompanying me to the meeting of the Rotary Club of Hinche and serving as interpreters. The president of the club, Germanité is a woman! She appears to be extremely competent and also speaks English quite well. We agreed on cooperating on a grant proposal to Rotary to support teacher training in Hinche. Before leaving for Hinche, I had already met with Ann Appel of the Monterey Pacific Rotary Club on the grant requisites and procedures, so I was able to speak knowledgeably about the process with the Hinche Club. They were very enthusiastic, so I’m optimistic we can establish a good relationship between the Rotary clubs here and in Hinche. One of the members also wants to join the teacher training program. Darus Alberuc teaching with the XOs. In the class we observed, students were learning keyboarding by typing in words shown in floating balloons before the balloons burst. Not only were they learning keyboarding, but also how to spell English words and words in other languages. Darus is a wonderful and compassionate teacher; his love of the children is obvious inside and outside of the classroom. Pere Noé has gotten the food program down to a science. It is running so obviously more efficiently than last year, when he first arrived at St. André’s. I barely noticed that the lunch had even begun, as I was waiting for the usual chaos that did not materialize. There are now 15 people working from before dawn into the evening to prepare the food for the burgeoning numbers of children in the school. Noé says they are now adding dried fish for more protein, plus beans, pasta and veggies. 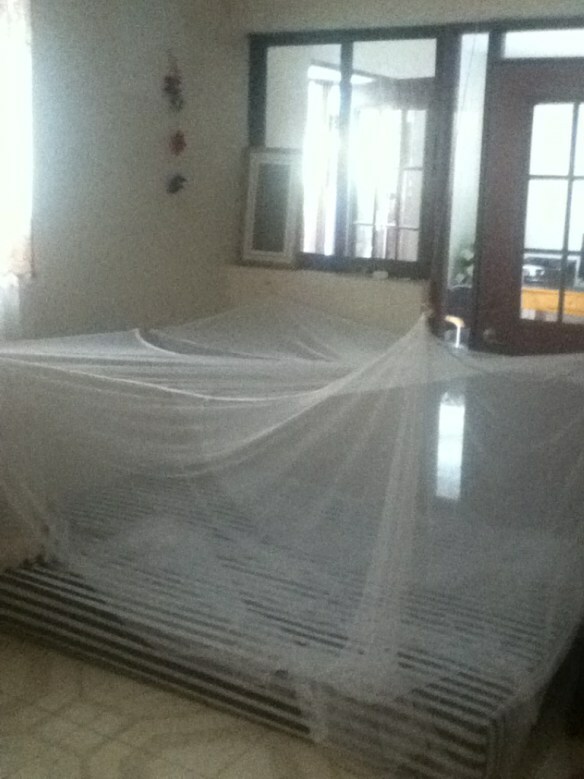 Noé’s dream of self-sufficiency is making progress. He says that now 40% of families pay full tuition; 20% pay partial tuition; 15% are fully subsidized, leaving the other 25% supported by St. Dunstan’s contributions. Here are photos of the new building construction for George’s enjoyment. 😉 Noé plans to have a second story built in the next year. Once the second story goes up, the computer room will no longer be needed as a classroom and the computer lab can be a reality. Hello my friends from Saint Dunstan. Greetings! On Behalf of the teachers ,parents , the kids and myself I would like to take this opportunity to thank all of you for your support for the academic year 13 – 14. The academic year was a success with 90% of our kids passed their test to go to the next class. There are two reasons behind this result ,first the kids eat better and the teachers are on time to teach ,also we pay them on time as well. The parents also participate in the process as well. we do have a committee of parents in the school . At the moment we now have 250 new students in different grade but as you know the 13th grade will leave to go to university ,may be in port au pce or somewhere else. We are finalizing our budget for 2014 and 15 and will a send a copy ,as you know English will be taught this year from 1st grade to 13th with more books and practice ,we do hire a nice woman to teach the kids from 1st to 6th and Evens will be as usual in the secondary from 7th to 13th .,we also hire two other teachers to train the kids for better skill in computer while Herodion and Dalus are doing their bestto help set up the good system we hope .As you know I am here in this school to make sure everyone is doing their part to make the school the best school in Haiti,the bathroom and toilets are kept clean ,the kids wash their hand with soap every time the use the toilets. One other aspect in the schooI am trying hard to organize is for music for the school wich I think is very important ,this year we will teach music from 1st grade to 11th grade to have a better band for the school ,I am also appealing for more instruments, the music academy for st andrew wich started at the beginning of july now have 150 kids in total . At the moment we are preparing for the next academic year ,we are repairing benches ,chairs ,tables ,organizing more space for new kids and seminars for teachers ,the different head of section and school starts in the first Monday in September, but for the officials class ,like 6th ,9th,12th 13th ,the wil start in the first week in august .Things are difficult but we keep trying hard to make a difference here in hinche .The water pump is working well so far but I am very busy. 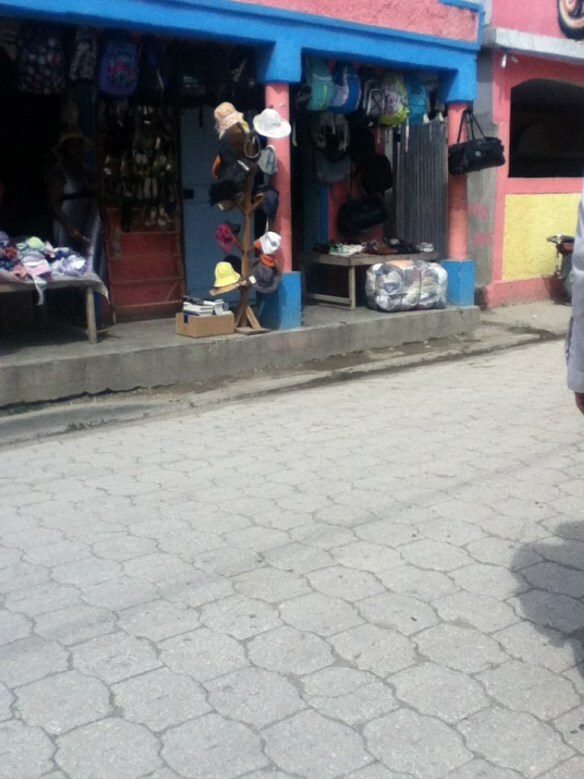 I recently was communicating with two of the teacher trainees in Hinche on Facebook. I would like to share their messages, showing their appreciation for the teacher training that we have been providing through the partnership with MIIS and St. Dunstan’s. 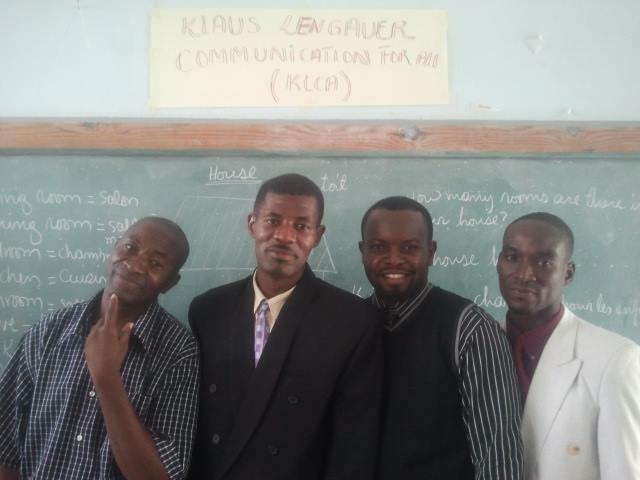 Shester (second from left) and Marc with other teachers. Good afternoon Ms Sanders, How are you doing? Hello, Shester. It’s a beautiful morning here. How are you? Thank you! So are you happy with our cooperation so far? Great! I hope we will have a new team in January. How is your family over there? We are great. Having our summer vacation now. Then, after vacation, start thinking about St. Andre’s again. How can we improve the program? Maybe we can talk about how to make it better. Can you Skype? Father Noe Bernier Is a special person in our community. 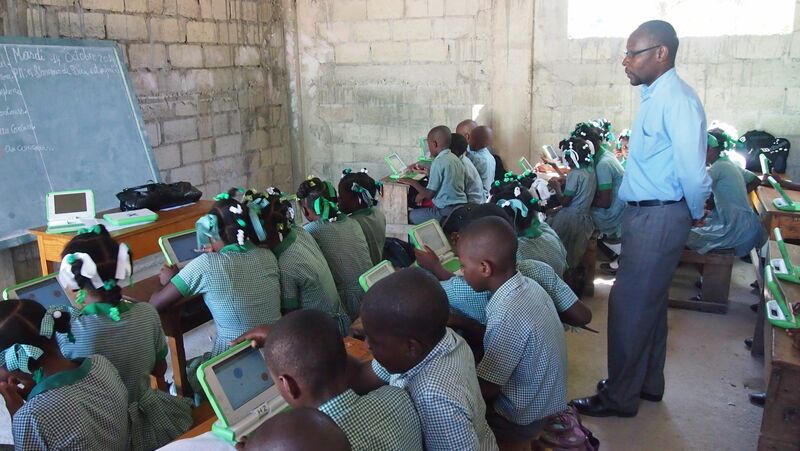 trying to see how he can contribute to change education system in Haiti with your support. On behalf of the teacher staffs you will not be disappointed. I am opening a Skype account to keep talking to you. When i get it I’ll let you know. I would love to see the pictures, when you are able to post them. Hi Mrs Lisa! How are you doing? I thank you so much for the training program workshop for english teachers. I’m so happy to hear from you. thank you. What are you doing this summer? I hope I can come to see all of you in October. Will you be at St. Andre’s? of course i will. I would like to see you too. I would like to have your ideas on improving the program. Fantastic! We really appreciate the program and we are better in teaching. Thank you so much one more time to think about us! Sora travels with Father Noe and the St. Dunstan’s Youth Missioners to Saints Innocents in LaBegue. As the priest here in Hinche, Pere Noe is in charge of not just one church but a whole parish of them. 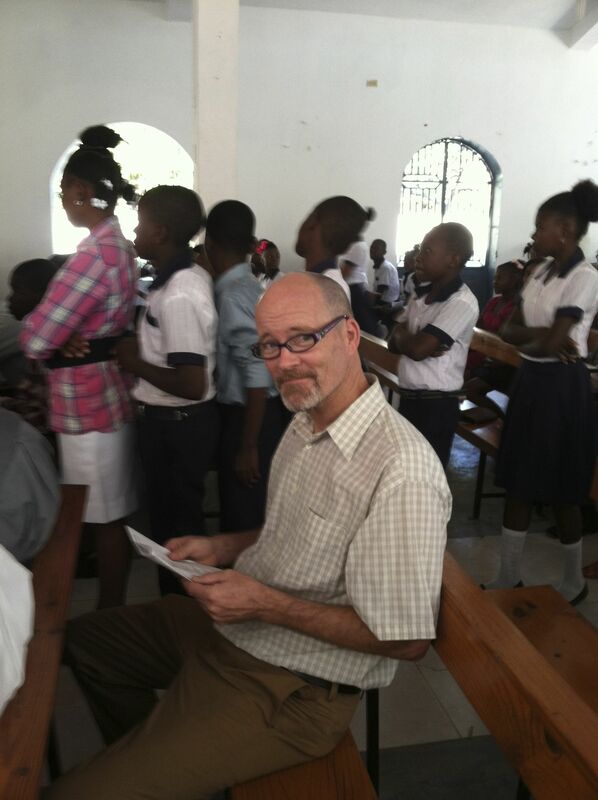 He lives and works at St. Andre’s, but spends a lot of time traveling to the other churches he’s established in the surrounding villages – some Sundays, he gives the sermon in three different places, which may be hours apart from each other. 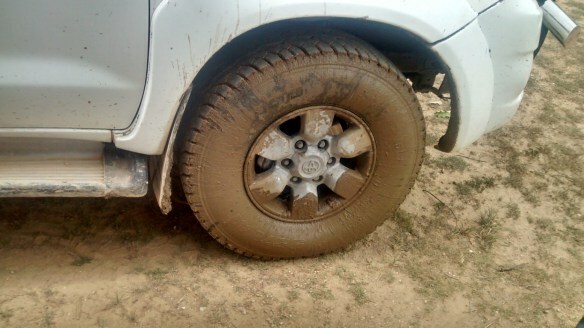 The road can be a little muddy. 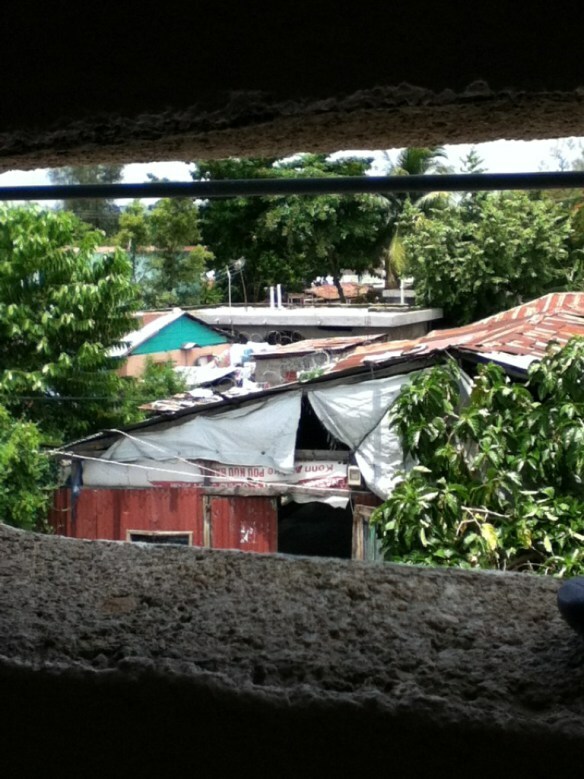 In addition to taking care of these communities spiritually, Pere Noe works wonders in order to support them financially. 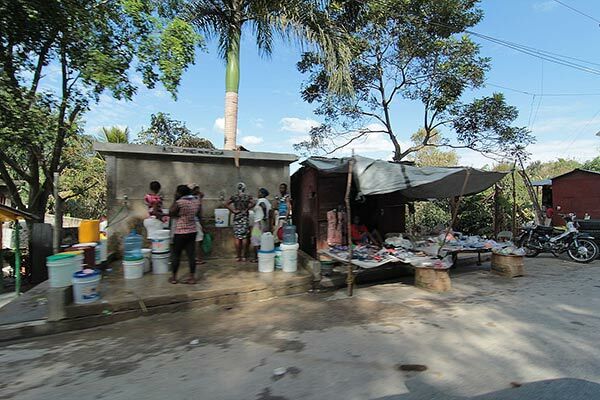 He travels to fundraise money from American churches in order to construct church buildings, schools, and even resources like clean drinking water. 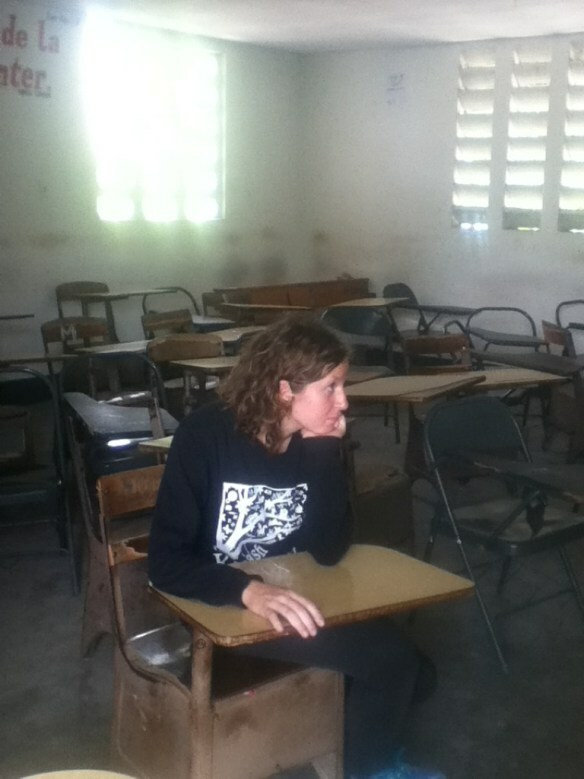 Sora from Unleash Kids and Project Rive shares her experience at St. Andre’s School in Hinche. We leave Hinche at 4 in the morning (yes, you read that right), so here’s a wrap-up post where I dump all of my photos on you and reminisce about the time we’ve had here. Let’s review what happened: Mario came down and hosted two training sessions for a small computer club we got together. I met with the folks from California who have been supporting all our work. We figured out a few more options for Internet connection here. And I got to see all my friends again and make some new ones, which is kind of the whole point all along. 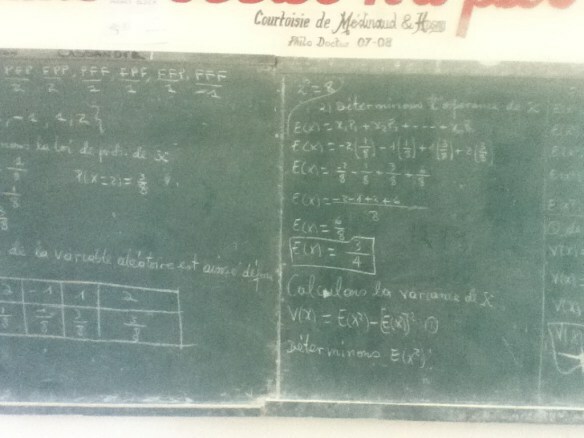 Advanced math on school blackboards. Checking the WiFi signal strength. 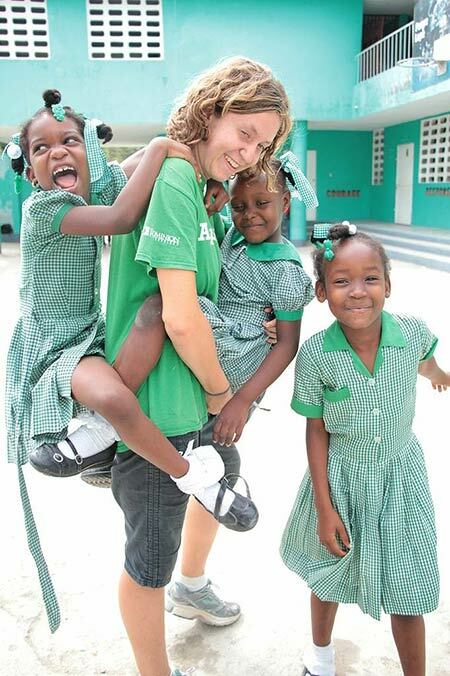 Seventh Day: Unleash Kids Travels North to Hinche, Haiti and St. Andre’s School! 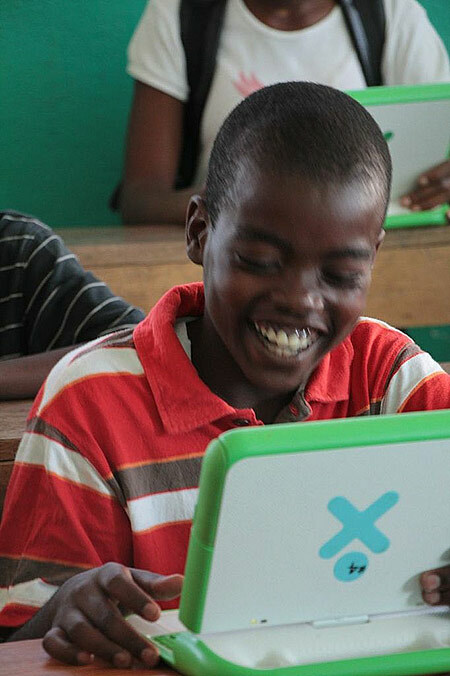 UnleashKids.org visited St. Andre’s in January to advance the One Laptop Per Child program. We are so grateful for this partnership of dedicated folks. Early this morning we (Unleash Kids!) 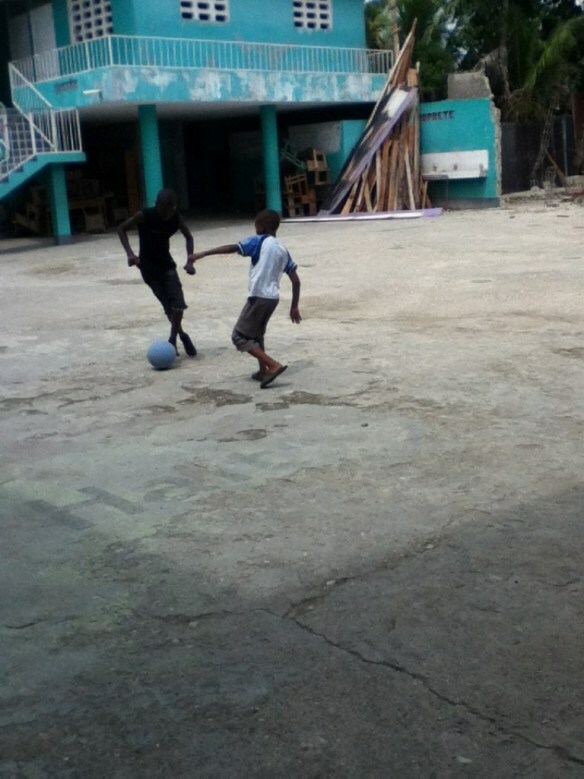 left Port-au-Prince for a 2 or 3 hour ride to St. Andre’s School in Hinche. 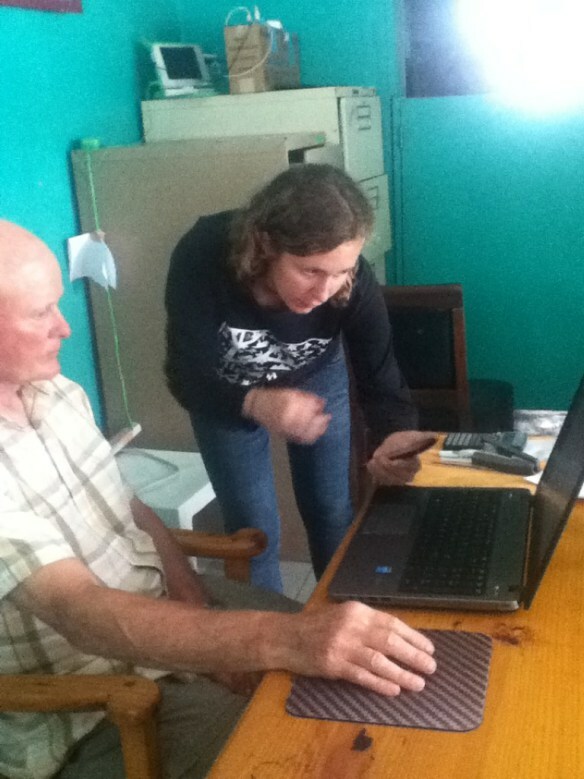 Once here, we had some lunch and got to work checking out XO laptops and determining what kind of Wifi we can set up. Junior and Jeanide taught an XO class and we went over Sora’s recently developed class guide with one of the St.Andre’s teachers. After dinner, we stayed up flashing and fixing the laptops. It turns out around 200 students here are vigorously using them, and we’re very happy to see that! 100% of your donation goes to St. Andre’s school operations. We are only $3000 short of our $35,000 goal and still have matching funds available. We know there are folks out there who want to help, but have just been too busy and haven’t gotten around to it. 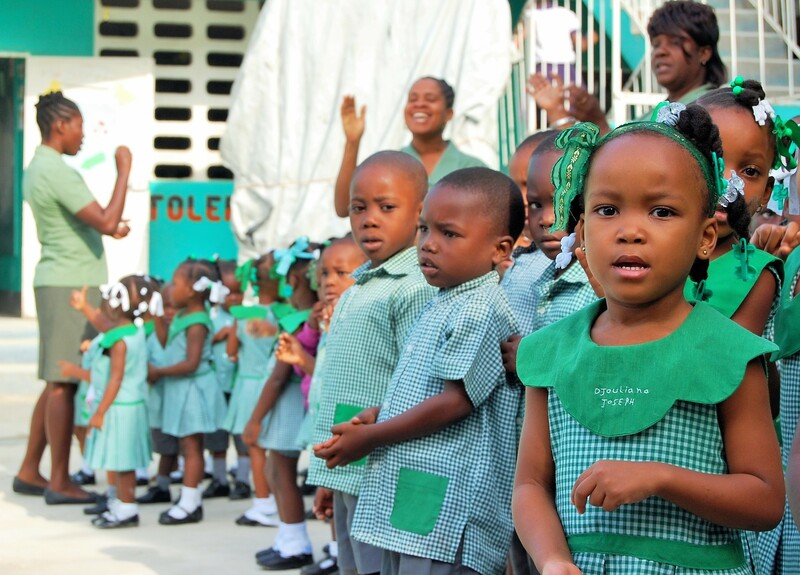 Now is the time to write that scholarship check, have your contribution doubled by the Haiti Team and help us move into summer knowing that the children of St. Andre’s School will have our support for another year. 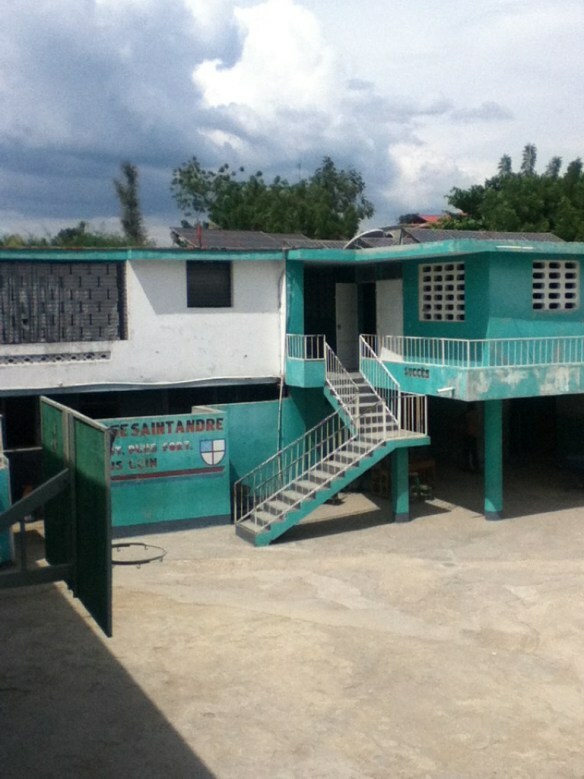 The St. Andre’s school is well on it’s way to meeting the priority goals of development for all Episcopal Schools in Haiti. 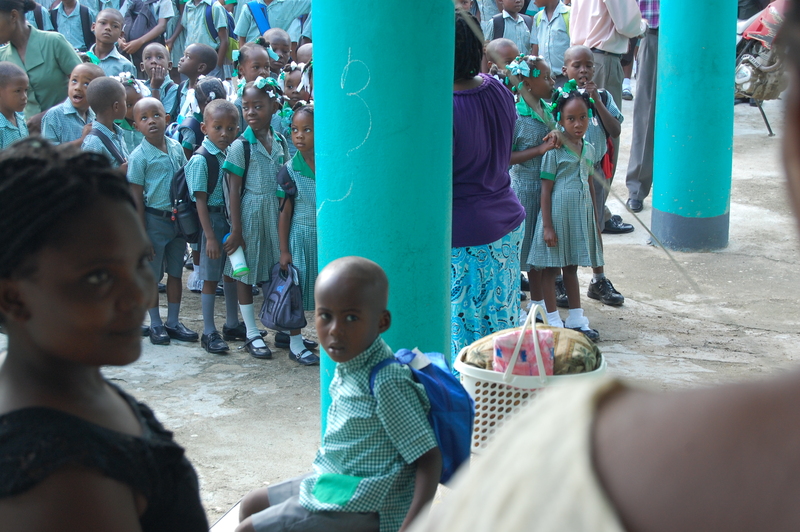 Thanks to everyone for their unwavering support for this mission and the children of Haiti. 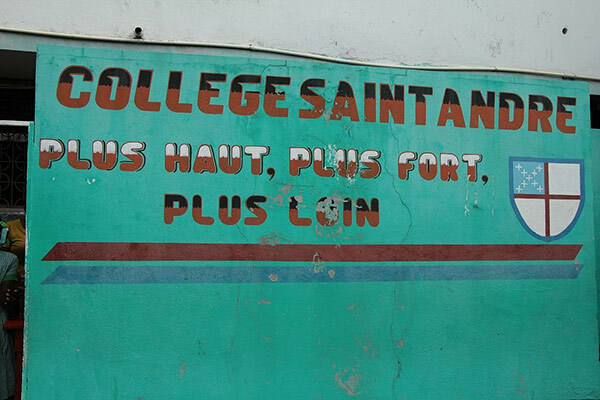 Skilled teachers are a cornerstone of educational excellence, and delivering quality teacher education programs in the Diocese of Haiti is challenging. Bringing teachers together is costly both in terms of time and expense, as is access to technology for virtual training. 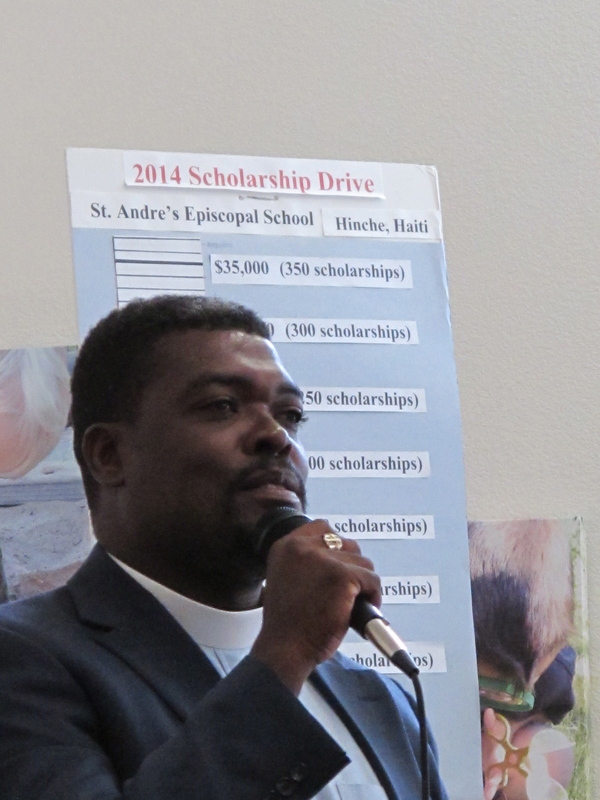 The Diocese is interested in funding and partnerships that can bring together Haitian teachers and educational experts. 2. Access to information technology at all schools. 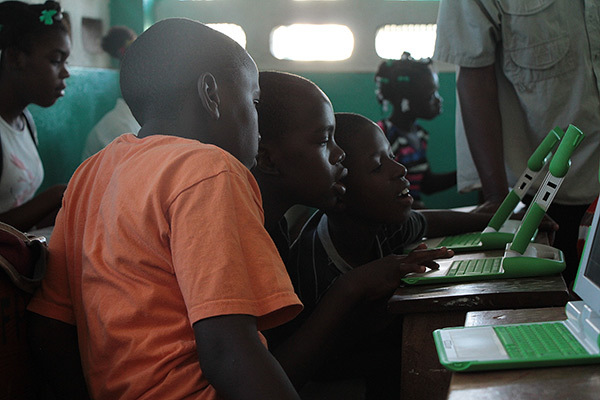 Without technology, Père Beauvoir noted, students in Haiti will not be able to receive a top-notch education nor be prepared for the next stage in their education and professional lives. This is a challenging but necessary goal, particularly for rural schools. 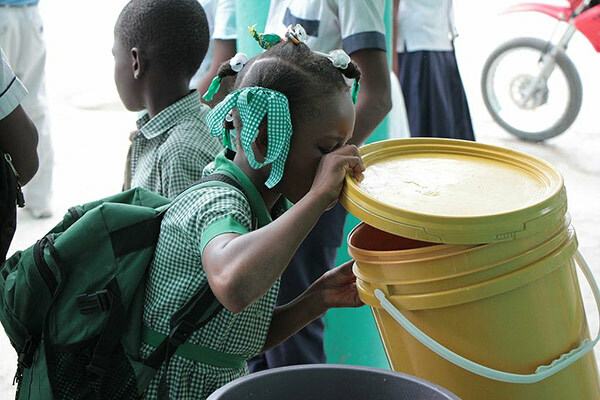 A Haitian proverb says, “An empty bag cannot sit on its own.” Adequate nourishment is a prerequisite to learning, and yet food security remains a major issue; many children simply do not have reliable, daily meals that provide adequate nutrition. Currently, less than 10% of the diocese’s schools offer a food program. The goal is to have at least one meal a day offered at all schools. 4. New, expanded, and repaired buildings. 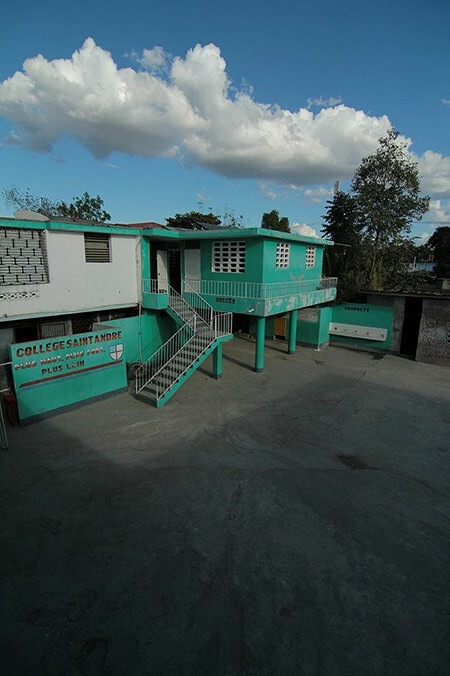 Numerous schools were damaged or destroyed by the earthquake and continue to operate in temporary structures. Others do not have adequate space for the number of students enrolled or the ability to serve all of the children who would like to attend. 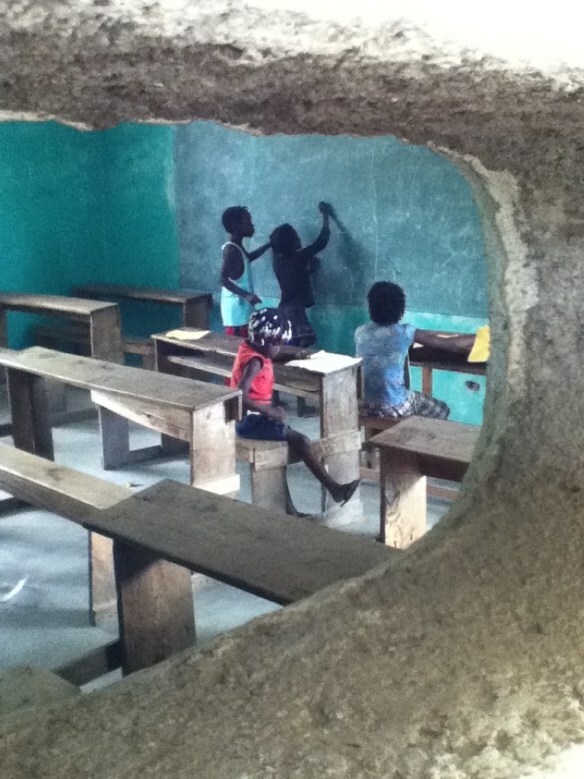 Creating well-built classrooms of appropriate size remains a pressing need. 5. Improved teacher salaries and working conditions. Schools rely primarily on school fees to support financial operations. However, families cannot always pay their school fees consistently, making it even more challenging to compensate teachers regularly and adequately. Many teachers and school administrators travel long distances to reach school and class sizes are quite large. By improving teacher salaries and working conditions, along with teacher training, the Diocese aims to recruit and retain outstanding teachers who will be able to make a long-term commitment to their schools. Father Noe did most of the service this morning and then headed to two other parishes to do services there. Back about 16:00. He says his combined parishes have about 2500 parishioners. 1. Sora is phenomenal. Especially having just graduated from high school. She has been working with her boss and Dennis I think it is to more transparently configure the XO systems and to get the linux system to interface with the the XO internet in a box. She has also spent a lot of time with me trying to figure out why the Datacom internet access stick that drives the wifi in the school office has not worked since the evening we arrived. In the process we have been refining which is the better internet provider. Our latest choice would be Datacom fiber. That is a new service that is available. Currently only four in Hinche. We are going to visit one of them this afternoon. Mario says that would be the best in the long run and by far the most reliable. May cost a little more. 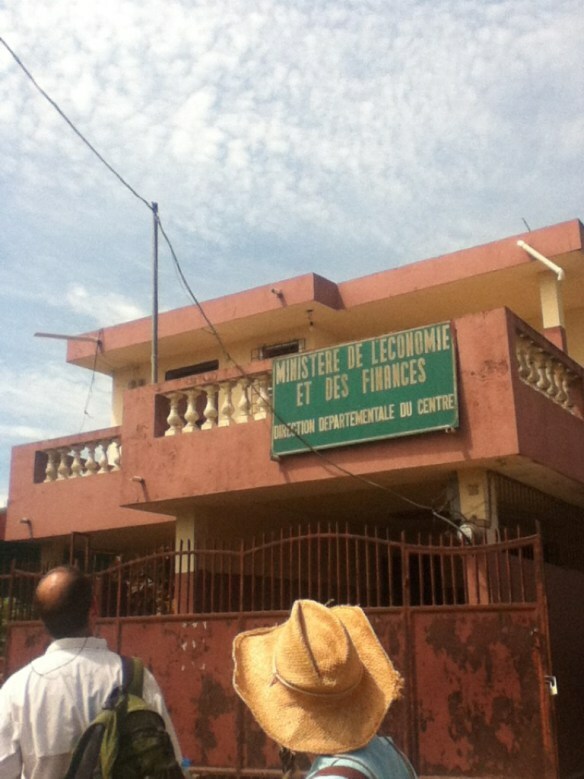 The Haitian government owns 40% of Datacom he says. I will bring cost figures. 2. Mario has been training those selected to run the computer classroom. They have identified three students to assist with that in addition to two of the teachers one of which is a girl. Mario has given them more than 4 hours of high level computer instruction. He has a BA in computer science and an MS in something else and does this training independent of his real job in PaP. This is the first time he has been to Hinche. He is really sharp. He has used a computer driven projector and now they see the advantage of it for teaching and want one. Sora knows someone who is in that business and will get some prices. Mario leaves this morning and Sora early tomorrow morning. 3. 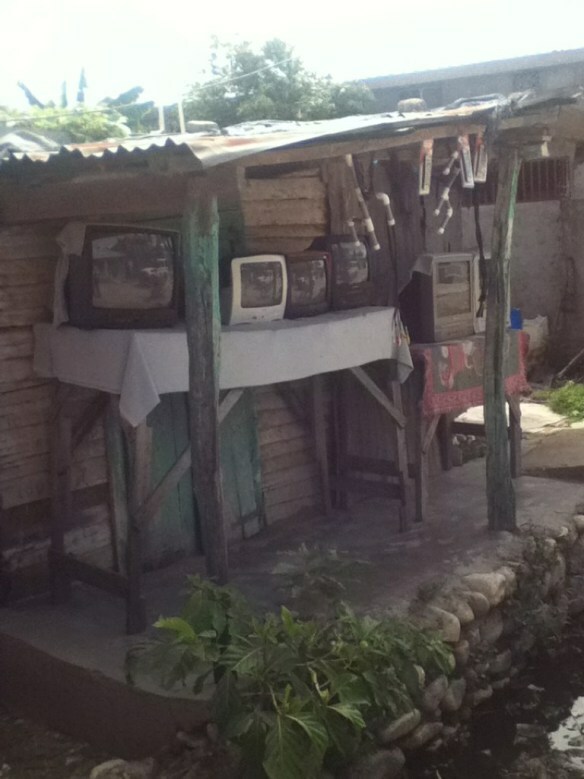 As mentioned in an earlier email Noe is taking his time selecting the best internet option. Hopefully our experience and suggestion will have some effect. The Datacom office is half a block away. He has more work to do in the computer room as mentioned in the email that George commented on. 4. The XO server can connect to the internet at times but is very slow and it resets all the time. It is also supposed to broadcast a wifi signal that those with external computers are supposed to be able to use but that has only worked for an hour when we first got here. To communicate while we are here we are going to steal the XO stick or borrow one from Noe but he won’t be back until sometime later today. 6. Otherwise normal: water leaks, lights that don’t work, hot and humid, Noe overworked with all his responsibilities, all roads but the main one from Pap to Hinche dirt and severely rutted, lack of tools to put up some fans, etc. 7. Have been some minor health issues but all are fine now.